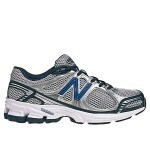 You are here: Home / online shopping / Women’s New Balance Running Shoes only $29.99! 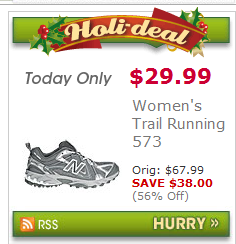 Joe’s New Balance Outlet has a HOT deal on women’s running shoes today! You can grab a pair of New Balance Women’s Trail Running 573 shoes for just $29.99! That’s 56% off the regular retail price of $67.99! 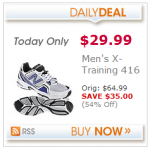 You’ll find lots of other great deals on New Balance shoes for men, women, and kids, too! You can save up to 70% on some items! You’ll find this deal in the upper right hand corner of the site when you get there! N-FUSE® combines the foam of two different densities. The top foam is less dense for soft cushioning, while the denser bottom foam provides support and compression set resistance. 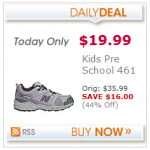 Kids’ New Balance Shoes as low as $14.19 after cash back! 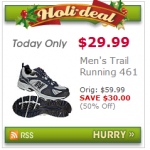 HOT DEAL ALERT: Men’s New Balance Running Shoes only $29.99! 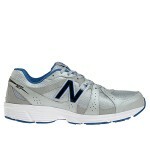 Men’s New Balance Cross Trainers for just $29.99! 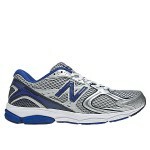 Men’s New Balance Running Shoes only $27.99!